UK car sales in 2013 recorded their best year since 2007, industry figures have shown, helped by cheap credit deals and stronger consumer confidence. The Society of Motor Manufacturers and Traders (SMMT) said that 2.26 million vehicles were registered in 2013. That was a 10.8% rise on 2012, although the figure is 6% lower than 2007's 2.4 million figure. The 2013 total was boosted by a 23.76% rise in sales in December, marking the 22nd successive month of increases. Industry analysts say that attractive financing deals have tempted buyers, with three-quarters of sales to private buyers now involving some kind of financing package. Economic data in recent months has indicated that consumers are more confident. Analysts have also pointed to refunds from mis-sold payment protection insurance policies as helping to drive sales. Average payouts have been about £3,000. The UK figures contrast sharply with the rest of Europe, where sales have tumbled in recent years. According to the European Automobile Manufacturers' Association, figures for the 11 months to November show that sales across the region fell 2.8% to 11.4 million cars, putting it on track for a sixth straight annual decline. Full-year sales in 2012 fell 7.8% from the year before to 12.5 million vehicles. Mike Hawes, SMMT chief executive, said: "With its best year since a pre-recession 2007, the UK new car market has helped stimulate the country's economic recovery. "While the European market is only now showing signs of improvement, the UK has consistently outperformed the rest of Europe, with 22 consecutive months of growth. "The 10.8% increase in 2013 reflects the attractive financial offers available, as well as increased demand for more technologically advanced new cars. We expect new car registrations to remain stable in 2014 as customers return to a more regular replacement cycle," he said. The SMMT figures confirmed that Ford was the UK's top-selling brand last year, enjoying success with its Fiesta supermini and mid-sized Focus models, followed by General Motors' Vauxhall Corsa and Astra models. The SMMT also said that one-in-seven, or 300,000, of the cars bought last year were built in the UK. 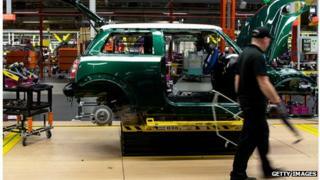 Most cars built in the UK are exported. Last month, the SMMT said that car production in 2013 was likely to be at a six-year high with more than more than 1.5 million vehicles built. Growth was driven by the rollout of new models, including the third-generation Mini, the SMMT said. Thousands of new jobs were created in the industry as both Jaguar Land Rover and Bentley expanded their operations in the UK. Howard Archer, chief UK and European economist at IHS Global Insight, said: "The strong increase in private car sales in December indicates that demand for cars is holding up well despite consumers' purchasing power being squeezed by inflation persistently running well above earnings growth. "The auto industry will clearly be hoping that UK economic activity holds up well through 2014 and beyond, and that this underpins consumer and business confidence and their willingness to splash out on new cars." However, there was a warning that the car industry's heavy reliance on luring buyers through credit deals could have a sting in the tail. John Leech, UK head of automotive at business services group KPMG, said: "The real story in 2013 has been the success of the Personal Car Plan offered by car manufacturers. Gone are the days where the consumer asks the bank for a personal loan. "Car dealers now sell finance with the car where half the price is paid over 36 months and the remaining half is cleared by a bullet payment at the end of the three years. "However, the danger for car manufacturers and used car dealers is that the supply of three year old cars is starting to ramp up and, maybe in a year or two from now, will exceed demand leading to a potential residual value price crash and increased risk of loan default by consumers."